Nate’s last haircut experience was horrible and I don’t want him to go through all that again. I was unable to document his previous barber shop experience with a kiddie barber shop because I didn’t have photos and it wasn’t so pleasant, he was just wailing the entire 5 mins or more, it was very frustrating for me (and I’m sure for him too). It was nowhere his very first haircut experience at an adult barber shop. So, with the help of some Youtube tutorials, I found the courage to try to cut his hair by myself, at home. It wasn’t easy, it wasn’t perfect, it was funny and time consuming, but we made it, haha. I need more practice though, it wasn’t done well. So yesterday, before going to church, I had to put gel on his hair so it would stick and the badly done haircut could be hidden. haha. Well, for now, at least, his hair’s shorter. I think it’s a lot better to do it this way than to take him to the barber shop for now. At least this one’s inexpensive and I’ll learn to cut hair as well! haha. Pwede na ako magpatayo ng barber shop pag na perfect ko ‘to. lol! 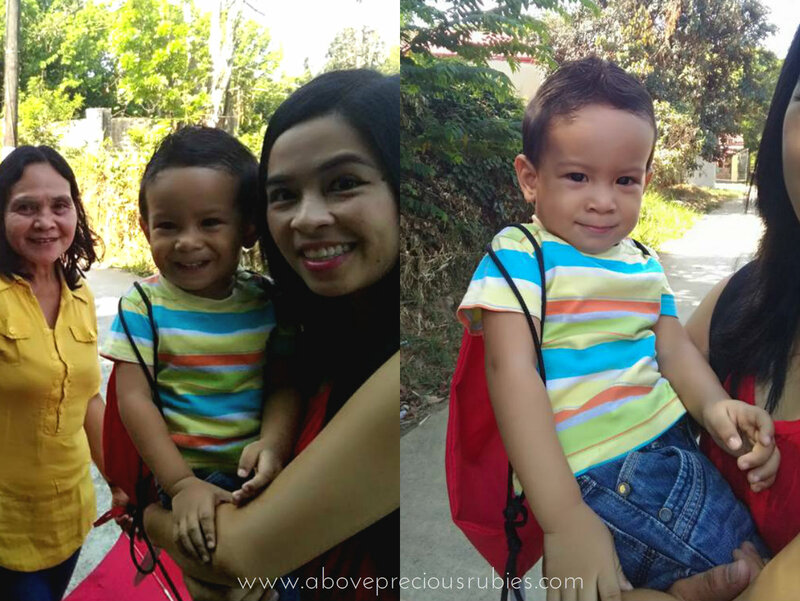 Nate with his lola and tita on our way to church yesterday. Do you cut your child’s hair? How did your first haircut experience go? I wish ok sa kanya ang kids salon sis, the amount is pricey pero walang problema kung di sya iiyak, kaso, panay parin ang iyang nya kahit sa kid's salon. Sayang ang bayad. lol. When my twins discovered how to use scissors, one of the girls cut her hair, it's a good thing she did it on the front side so it could pass off as bangs. I had to repair it to make it look normal, lol! And that's when I decided to try and cut their hair. It's so fun to be able to do that for them! Ang galing mo gaw ah! hahahhaha! nako buti nakaya mo, thinking my Zd first haircut also, cguro nakita mu naman kalabasan diba? lol! Cute! I think you did well as your first haircut. Mas nakatipid kapa. I'm not sure I can DIY cut my little girl's hair just yet. Nice cut for your little boy mommy! Way to go! I actually never did try! I should had but I couldn't rewind the 18 years! with the help of chocolates gaw, kinaya ko! hahaha! Thank you sis! Thanks to youtube! haha. But I need more practice! lol! I so look forward to the day when he will not be afraid of scissors anymore, sis! haha! Korek! Thank you! Sana mas mag improve pa! lol! I always look forward to the time na maka graduate din ako dito sis, haha. Marami ka tlagang matutununan as a mom, Mommy Nilyn. Hehehe! I have no courage to cut my kids hair though. Medyo hyper kasi yung lalaki ko. Siguro on the first to second tries, medyo hesistant pa sila but eventually they'll get use to it…don't worry. With my son, I had let him sit on my lap while his having a haircut…pero ngayon, he's doing fine. Hahaha. Ang cute ng video. At ang gulo ni Small boy. I assume I will also do the same to my eight-month old should his hair grows long. Ihihi. You did well Mommy! Nate's too cute on his new hair! You're such a brave Mommy. As for me, I don't think I will be able to DIY my son's haircut as I am afraid of injuring him once again (like when I cut through one of this fingernail skin when he's barely a month old while I am attempting to cut his nails). wow! your boy is great! My son kasi he would great the people he knows pero pag kinuha na sya or hinawakan, he'd cry! haha. True! Not only that, matututo rin ang parents. lol. Pero if only my son won't cry, mas maganda parin talaga sa shop sya gupitan. I'm pretty sure in time, he'll learn and realize that barber shop is part of his life. lol. I just have to deal with it for now since he's not yet ready. lol. go sis, yakang yaka mo yan! 🙂 hehe. Thank you! It wasn't easy but it's better than him having a long hair this hot summer! Ayaw nya kasi talaga sa barber shop. lol! May partner was the one who made the first haircut for my boys. But not actually a haircut kasi kinalbo nya hahaha! You boy looks really nice after the cut. Oh I get you! We've got three little boys and when the budget is a bit tight, my husband cuts their hair. I don't always like it, hits and misses talaga, haha, but hey, matipid ha. Your son's hair looks good. Great job! I cut my boys' hair and super funny lagi when we're done haha. Ang hirap kasi! I saw a baby hair clipper nga sa metrodeal and I'm so tempted to get it. Kasi parang when the barber does it with the hair clipper ang dali dali lang. Good job though with your haircut. Mas malala yung akin haha. Great job! I have no talent whatsoever in cutting hair. I've never tried to cut my kids' hair. I'd be too scared to try for fear of doing bad job. Haha! I think you did a pretty good job for a first try. haha. Thank you, may mga palpak jan, Mommy pero pwedeng itago. lol. I was planning actually na kalbuhin sya kaya lang, I can't imagine him bald! haha! Thank you Mommy May! I completely agree! Tipid na, makapractice pa si mama. haha. Thank you! If only he would let the barbers cut his hair without wailing like he's going to be cooked, I'd rather have him cut in a kiddie barber shop as well. haha. Thank you! haha. Maraming di pantay jan mommy, that's why I had to have a gel! hahaha! Me too! I just had kapal ng mukha to try! haha! Thank you! I think I'll do more of these 'til he won't cry at the barber shop! haha! Yan ang mahirap pag ayaw nila. Ako, I was too worried baka masugatan sya, good thing, we had chocolates in stock, I used them to my advantage! haha. 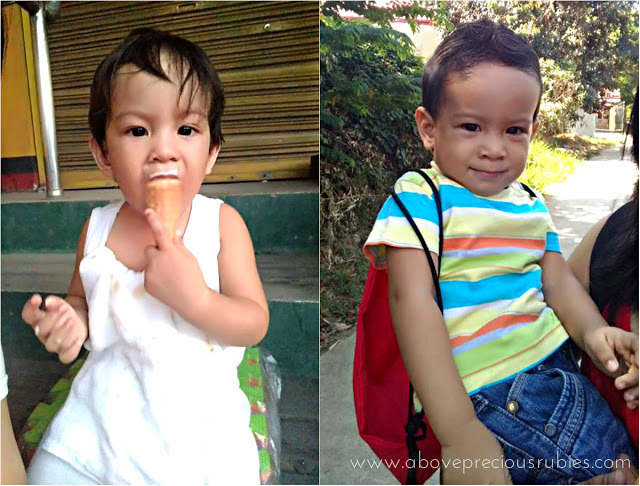 Hi Mommy Nilyn, I love your blog! You share a piece of your world or knowledge in a nice and unique way. Keep it up, I'd love to come back!